Step One: The first step in finding the right RV to meet your needs is to determine exactly what your budget is. Are you planning paying cash for an RV? Are you liquidating assets to finally purchase the travel trailer you’ve been dreaming about, or are you thinking about financing? These questions should be answered to your satisfaction before you start your search for an RV. The reason for analyzing your budget before looking at RVs is to ensure you don’t go beyond your means. Liberty RV can help you assess your finances before you begin your search. Call 816-415-CAMP to speak with a specialist about your plan to buy a new RV. Step Two: Once you have determined how you’re to pay for your new RV, you’ll be able to narrow down your search to models that will better fit your lifestyle. Regardless of which option you decide on, you’ll be better situated to make an offer on an RV if you know beforehand whether you can afford it. New financing options at Liberty RV can help you find the right RV for sale in Blue Springs. Consumer experts agree that financing the cost of an RV is the best way to maintain your personal financial flexibility- and you may even qualify for some of the very same tax advantages as if you owned a second home mortgage. Step Three: Armed with pre-approved financing, you can start searching new or used models to find an RV that is suited to the needs and desires of your family. If you’re not quite sure what these are, consider making a call to an RV dealer to discuss your options. Understanding how many people will be traveling with you and what you’re looking for in a camping experience can help your agent match you up with the perfect travel trailer. Consider calling Liberty RV at 816-415-CAMP for ideas and insights into a model that will suit your tastes. Step Four: Take advantage of online resources, like local websites that feature new and used RVs for sale in Blue Springs. Stop by LibertyRVMO.com and click on the ‘New RVs’ or ‘Used RVs’ link to see what’s currently available in the inventory. We’re certain you’ll find something that speaks to you in terms of affordability and function. New 2018 models are in stock and ready to be inspected inside and out when you stop by the lot. 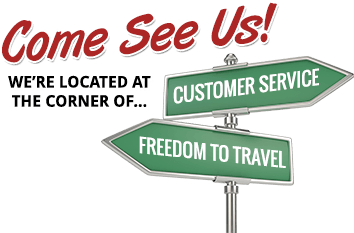 Take a few minutes and visit the Liberty RV website and discover why they are considered the leaders in affordable, comfortable travel adventure. Liberty RV is located just outside of Kansas City, MO. Get easy to follow directions on the site or make a call now to an agent to discuss your trade-in. You won’t find a better deal on a new or used RV in all of Missouri. Click the ‘Deal of the Week’ to save even more on your upcoming excursion.